Until former Rep. Tom Perriello (D) shook up the Democratic nomination contest in early January, the Republican field had generated most of the early buzz in Virginia’s 2017 gubernatorial race. But while some eyes have turned to the brewing battle between Perriello and Lt. Gov. Ralph Northam (D), there is still plenty to discuss on the Republican side of the primary aisle. Last week, the Crystal Ball explored the Democratic matchup; this week, we take a look at the GOP clash. No Republican has won a statewide election in Virginia since 2009, but the four candidates seeking the party’s nomination aim to change that this November. For the first time since 2005, the Republican Party of Virginia will employ a primary to pick its nominees for the three statewide offices up in 2017. However, that was not the original plan. In June 2015, the state’s central committee narrowly voted to hold a presidential primary in 2016, bucking the desires of more conservative members of the party who favored holding a convention instead of a primary. But as a part of holding a presidential primary in 2016, members compromised to recommend the use of a convention to select statewide nominees in 2017. But in August 2016, the central committee went against that compromise — by one vote, 41-40 — and opted for a primary in 2017. While the party held a gubernatorial primary in 2005, it was very uncompetitive. The last time the GOP held a meaningful primary for the gubernatorial nomination was way back in 1989. The shift to a primary probably benefits Ed Gillespie, the frontrunner in the GOP gubernatorial race. The former chair of the Republican National Committee officially launched his bid for the state’s Executive Mansion in late November 2016, but he had unofficially been running since 2015, revealing his plans in October of that year. At the start of 2017, his total cash on hand — between his campaign committee and PAC — was just under $2 million. Not only has Gillespie gained backing from a large number of GOP bigwigs as well as many grassroots activists in the state, but his resource advantage over his opponents should enable him to develop a larger campaign infrastructure, run more ads, and make more voter contacts. Gillespie likely would have been favored even if a convention system had been employed in 2017, having won the party’s Senate nomination in such a format when he ran in 2014. In GOP primary polls dating back to June 2016, Gillespie has consistently led the field. Most recently, a Quinnipiac poll in December 2016 found him at 24%, with Rep. Rob Wittman (R, VA-1) in second at 10%. But Wittman withdrew just before the release of the Quinnipiac survey, leaving three other candidates to challenge Gillespie: Corey Stewart (4% in Quinnipiac), chair of the Prince William County Board of Supervisors; state Sen. Frank Wagner of Virginia Beach (4%); and the most recent entrant, businessman Denver Riggleman, a distillery owner in Nelson County (who entered after the Quinnipiac poll). Of that trio, Stewart has received the most attention for his gubernatorial bid, in which he is seeking to make himself the Virginia face of the GOP’s Trump wing. First elected to his county leadership post in 2006, Stewart has gained notoriety for his anti-illegal immigration policies and rhetoric. In 2007, Prince William County passed a new law that instructed police to check someone’s immigration status if an officer had probable cause to believe the person was an unauthorized immigrant. The new law attracted national attention, not only because of its controversial tenets but also because Prince William is in the DC orbit and is a sizable entity (at about 450,000 people, it is Virginia’s third-largest locality by population today). Although the county board eventually adjusted the law in the face of negative coverage and concerns regarding racial profiling, Stewart highlights the policy as evidence of how he would approach illegal immigration in higher office. Stewart became the Trump campaign chair in Virginia in late 2015, but ended his chairmanship with a bang in October 2016. Without the approval of campaign higher-ups, Stewart participated in a protest in front of the RNC building over a supposed lack of support for Trump. Shortly after, the campaign fired him. While Stewart’s time heading the Trump operation in Virginia provided him with opportunities to connect with Trump voters, it is an open question how much the position really helped him. For one thing, Stewart lags well behind Gillespie in the money race — he has $400,000 in his war chest versus Gillespie’s nearly $2 million. Moreover, it seems unlikely that Trump will come to bat for Stewart. First, Virginia was one of the 11 states where Hillary Clinton actually improved on Barack Obama’s 2012 margin. Second, although Stewart claimed that Trump’s victory “propelled [him] into front-runner status for governor,” Trump’s senior Virginia adviser said, provocatively, that “Mr. Trump doesn’t even know who Corey Stewart is,” and that Stewart’s focus on his gubernatorial run made him a “cancer” to the Trump campaign in the Old Dominion. Not exactly a ringing endorsement. As for the other two Republican candidates in the field, it’s difficult to say just how much or how little impact they will have on the nomination race. Wagner entered the race in late August 2016 just after the state party opted for a primary, which likely is a better format for Wagner, who is a more establishment-flavored candidate. On paper, Wagner — a Navy veteran, experienced legislator, and former shipyard owner — sounds promising. He won reelection in one of the few closely-contested state Senate races in 2015, raising and spending around $2 million, a solid fundraising figure. He is also the only candidate from the Hampton Roads region, which could provide him many votes in a crowded primary field. Still, Gillespie may have largely consolidated establishment support and Wagner’s statewide primary constituency likely overlaps with Gillespie’s (both are mainstream conservatives). Wagner also faces the legal hurdle of being unable to fundraise during the General Assembly’s session in January and February. Riggleman is largely an unknown quantity. In some ways, his campaign as a businessman and outsider may reflect a new pattern in politics following Trump’s success. As we noted last week, about a quarter of the nation’s 50 governors had no prior elected experience before becoming their state’s chief executive. But some old rules of politics still apply: Riggleman needs to find a voting constituency to have any chance and the resources to make inroads in the primary. Now a distillery owner, the former Air Force intelligence officer and defense contractor will probably have to bring personal financial resources to bear, though it’s unclear whether he can or will do so. And with Stewart’s efforts to be the Trump-like figure in the gubernatorial race, it may be difficult for Riggleman to build support. But regardless of how it goes for Riggleman, his #WhiskeyRebellion hashtag is an instant classic. 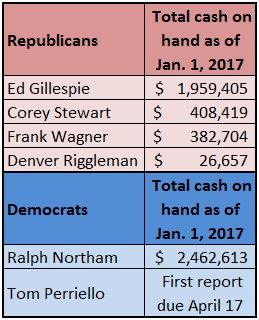 Note: The cash-on-hand figures are the sum of all relevant fundraising committees for the gubernatorial candidates as of Jan. 1, 2017. At this point, Stewart has captured many headlines in the race. For example, he gave away an AR-15 rifle last week as a part of a pro-gun rights fundraiser for his campaign. And Stewart has understandably sought to go after Gillespie, the frontrunner, in any way he can. Just after the election, Stewart said that “Ed Gillespie treated Donald Trump like he had typhoid,” part of Stewart’s general argument that Gillespie was insufficiently supportive of the GOP presidential nominee in 2016. On Monday, Stewart took “Establishment Ed” to task for not attending a gun rights rally in front of the Virginia State Capitol. It remains to be seen if any of these shots will really have an effect on Gillespie. For his part, Gillespie gained notice when he launched his opening campaign tour this past weekend, flying all over the state. Besides money, one advantage for Gillespie will probably be his recent statewide electoral bona fides. In 2014, he nearly upset Sen. Mark Warner (D) in a race that was not expected to be very close, losing by just 0.8 percentage points even though Warner outspent Gillespie $18.1 million to $7.9 million. Given the tiny margin, had outside Republican groups invested more than a pittance in Gillespie — the Virginia race finished 18th in outside spending in support of Republicans in 2014 — he might be in the Senate today. It’s true that Gillespie was the beneficiary of a friendly Republican environment, but he was willing to challenge Virginia’s most formidable politician and turned in an impressive showing. It is also worth noting that Gillespie ran better in Northern Virginia than any Republican statewide nominee in the past four years; in fact, he was the only one to carry bellwether Loudoun County among this group. (Loudoun is a highly educated, very affluent county that swung hard to Hillary Clinton in 2016.) Considering the importance of Northern Virginia to Democrats (42% of Hillary Clinton’s 2016 total vote came from the region), holding down Democratic margins there will be key to any Republican’s chances of winning statewide in 2017. Note: “Northern Virginia” includes the Virginia portions of the Washington-Arlington-Alexandria, DC-VA-MD-WV Metropolitan Statistical Area, as defined in 2015 by the U.S. Office of Management and Budget. Of the other three candidates, only Stewart has previously sought statewide office. In 2013, he ran for lieutenant governor, but finished third in the nomination race at the state party convention. Such events usually attract the most stalwart and, sometimes, most conservative voices in the party to determine nominees. Considering Stewart couldn’t win in an activist-heavy environment and the fact that the eventual GOP nominee lost by 11 points in November, Stewart’s nomination loss is hard to positively spin. Overall, the Republican nomination for governor is probably Gillespie’s to lose. He will have more resources, is better known than his opponents, and has sought to build a broad base of support that may inoculate him from attacks on his establishment ties. Gillespie already proved his ability to win grassroots support, having won the 2014 Senate nomination at a state party convention. Still, Gillespie has potential vulnerabilities if the electorate is particularly receptive to anti-establishment pitches: He is a former chair of the RNC, advised President George W. Bush and other prominent Republicans, and had a lucrative career as a DC lobbyist. If Stewart can rally pro-Trump forces and successfully cast Gillespie as akin to a NeverTrumper, his might have a path. And if the race becomes less clear cut, there might be an opportunity for Wagner to take advantage of potentially strong regional support in his home base of Hampton Roads to be competitive statewide. Lastly, Riggleman could conceivably steal the outsider mantle away from Stewart with his business background, and multi-candidate primaries can sometimes lead to seemingly strange upsets, particularly when the perceived frontrunners beat each other up. We’ll just have to see if the race gets more complicated. Obviously, it would be foolhardy to prognosticate with great certainty about any election 10 months out from Election Day. There are a multitude of examples for why this is the case, but the 1993 gubernatorial contest between longtime Attorney General Mary Sue Terry (D) and former Rep. George Allen (R) serves as a nice Virginia example. In an early May 1993 poll, Terry led Allen 56%-27%, but Allen romped 58%-41% in November. Campaign and candidate issues played a role in Allen’s sizable win, but national events probably didn’t help Terry. Throughout the summer, President Bill Clinton saw his national approval rating worsen, dropping below 40% in Gallup’s polling. While his national figure rebounded to the high 40s by November 1993, an exit poll of the Virginia gubernatorial contest found that 55% of voters disapproved of Clinton. As Clinton’s party-mate, Terry was bound to suffer for the president’s poor image in the Old Dominion. Still, we can expect the national picture to matter in November 2017, probably more than it did in 1993, given the increased political polarization and greater trickle-down of national politics into state politics since that time. Donald Trump’s approval and favorability will help or hurt the GOP; while these data might improve over the next 10 months, the early national numbers are poor. And in Virginia, two different recent polls have shown Trump’s favorability at -9 and -14, and one showed his net transition approval at -5. Should Trump’s numbers fail to improve, he could prove to be a drag on whomever the GOP nominates for governor. But Democrats may have their own problems. If Northam and Perriello engage in a knockdown-drag-out fight for the party’s nomination, it could prove costly and damaging. The GOP nominee could wind up with more money at his disposal, especially if Democrats spend millions in a competitive primary. For example, the Republican Governors Association just wrote a $5 million check to a PAC it controls in Virginia — the largest single contribution in state history — which it could use to back the Republican nominee (Virginia has few campaign finance limitations). This is not to say that a competitive primary is always damaging — for example, competition can improve a candidate’s political skills for the general election and increase his or her name identification — and some Democrats look forward to their race. Republicans might be harmed or helped by their primary, too. While early general election polling has limited value, perhaps tellingly the results have varied. The three most recent general election surveys between frontrunners Gillespie and Northam have shown Northam leading Gillespie in two December 2016 polls (Quinnipiac and GOP firm Public Opinion Strategies) and Gillespie ahead once in an early January survey (Mason-Dixon). 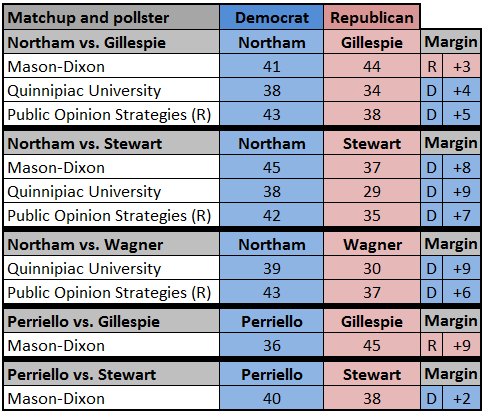 Only Mason-Dixon tested Perriello, showing him well behind Gillespie but slightly ahead of Stewart. Sources: Quinnipiac University poll, Dec. 6-11, 2016; Public Opinion Strategies (R) poll, Dec. 11-13, 2016; Mason-Dixon poll, Jan. 5-10, 2017. Historically, the Virginia governor’s race has been something of a negative referendum on the president’s party: From 1977-2009, the nominee of the party that did not hold the White House won the governor’s race. But current Gov. Terry McAuliffe (D) broke that streak in 2013, narrowly winning the governorship while Obama was president (McAuliffe is forbidden from seeking a second term by Virginia’s unique prohibition on a governor running for consecutive terms). The Republicans will try to return the favor in 2017 by taking back the governorship despite the GOP holding the White House. The first step to November will be the June 13 primary. What will happen in the Democratic and Republican contests remains to be seen, but this much appears certain: The 2017 cycle will be the first in Virginia history to feature concurrent contested Democratic and Republican primaries for governor. Only once before have the two parties both held primaries for the top office, but in the 1949 cycle the Republicans only had one candidate on the ballot. In 2017, both parties will have at least two candidates fighting for their respective nominations.